Commander-in-Chief of Bahrain Defense Force (BDF) Field Marshal Sheikh Khalifa bin Ahmed Al Khalifa (photo) paid an inspection visit to a number of BDF units to get informed about the military work process there and the preparation and training plans to achieve combat and administrative readiness, Bahrain News Agency (BNA) reported. The BDF Commander-in-Chief affirmed that BDF is going on with military development of all its weaponry and units. He paid tribute to BDF personnel for their dedication to attain the highest military readiness and remain the bulwark of the nation’s security and stability. He described defending the nation as a sacred and big responsibility, lauding the role of the BDF personnel in performing their duties. Earlier, the Bahrain Defense Force (BDF) held at the Royal Defense Force Training Centre a graduation ceremony for a specialized Officers' session. It was attended by the centre’s Commandant Major General Jaber Abdullah bin Hewil. The Commandant of the Royal Defense Force Training Centre presented the graduates and top achievers with certificates and prizes of appreciation. 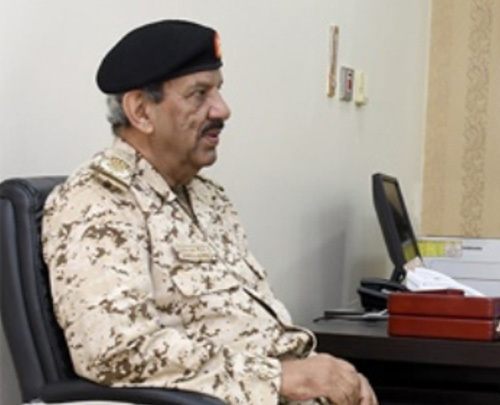 For his part, Commander of the GCC Unified Military Command Lieutenant General Eid bin Awadh Al Shalawi paid a visit to Bahrain Military Museum where he was welcomed by Media and Moral Guidance Director Major Mohammed Ketami Al-Kabisi. The GCC Unified Military Command Commander got informed about the museum’s halls and sections which feature a collection of historical collectibles, artistic military paintings and models which are considered as a documentation archive of Bahrain’s military history.